Low prices. OrangeSmile.com offers car hire service in Switzerland on the lowest-rate-guarantee basis, since we work with car suppliers directly. For your search criteria in Switzerland, we always select and show the best rental offers. The car reservation process consists of 3 simple steps: (1) search for available cars for your dates in Switzerland; (2) select your car type; and (3) fill in the booking forms. Once the reservation is completed, you will receive a confirmation voucher to your email address. During the booking process, please check your rental conditions. To pick up your car at the rental point in Switzerland, you need to provide our confirmation voucher, your driving license and a valid credit card. The final payment is normally carried out at the pick-up point. Our car hire points in Switzerland accept VISA, MasterCard, etc - please check your rental conditions. At the pick-up point, please read the handling manual and check the car for present defects. 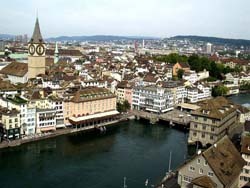 OrangeSmile.com wishes you a pleasant journey to Switzerland! The car hire reservation system OrangeSmile.com allows renting a vehicle in Switzerland within 10 minutes. Our largest database of car suppliers enables us to provide you a rental car in Switzerland at the cheapest rate ever possible. At rental locations in Switzerland we offer the following car sizes: mini, compact, economy, standard, premium and luxury. The following car types are available in Switzerland: Sedan, Hatchback, Jeep, Cabriolet, Coupe, Minivan and Minibus. Switzerland has prepared a great choice of entertainment for its guests. Simply every traveler will find here activities to fit one's taste. Several important landmarks can be found in Bern. The oldest religious landmark in the country, the French Church, is also located there. Built in 1270, the church was restored and redesigned several times. The inner design of the church amazes visitors with magnificent frescoes and elegant drawings. As the church keeps working, it's always crowded. Kornhaus granary is one more place that is worth visiting. Originally, higher floors of the building were used as a granary, while the cellar was used to store wine. In the beginning of the 19th century, Kornhaus was transformed into a tavern, and in 1983 it became the main club in the city. The building is distinguished by very interesting architecture - in it arcs you will see sculptures of dragons, mermaids and other mythical creatures. Kornhaus halls are decorated with historic costumes, statues and figurines that depict musicians. The Russian Church is an important tourist destination in Geneva. The church was built in the middle of the 19th century by initiative of La Grande Duchesse Anna Feodorovna. The sanctuary is distinguished by luxury design as many items in the church were gifted by the Royal Family. The city of Lausanne is also famous for its religious landmarks. Here travelers are recommended to visit the Church of st. Francis that was built in the 13nth century. During more than 7 centuries long history, the church has significantly changed its original look. The only thing that is left unchanged is elegant and strict design of halls. The local cathedral, which was built in approximately same period, features more luxurious design. Its doors and facade are decorated with figures depicting priests, Bible heroes and angels. The walls and ceiling of the cathedral are decorated with magnificent frescos. Among the sights of Lucerne the ancient Water Tower is one of the most famous. Besides its original purpose, the tower was also used as a prison and during several years it was even transformed into an archive and a treasury. Unfortunately, the original design and style of the tower didn't survive till our days, but numerous legends and stories known to every local and guide let us know about the tower and its former look. There is a chapel near the tower, and together these buildings form a part of a medieval protective facility. Despite the fact that the average confirmation takes 10-30 minutes, we recommend to make reservation a couple of days before the desired pick-up date. If you return a damaged car in Switzerland, please ask the staff to examine the car and write down all the defects found. Make sure that the document describing the defects is filled in correctly and provided to you in a printed format.